For most people giving up the day job and moving to a beautiful area of France and living off the vines is an impossible but delicious dream. In 1990, Patricia Atkinson and her husband decided to sell up in Britain and emigrate to the Dordogne. Their idea was to buy a house with a few vines attached and employ someone to tend to the wine while they earned their living with some financial consultancy work. There followed a series of disasters: the stock market crashed leaving their small holding as their sole source of income; the first red wine harvest turned to vinegar; and Patricia’s husband returned to Britain, unable to cope with the stress. He never returned. 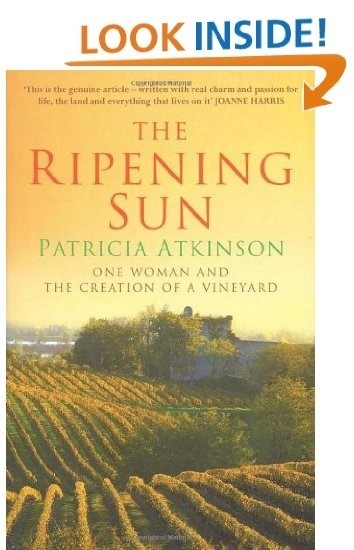 Patricia Atkinson, whose only knowledge of wine up to that moment was ‘that it came from a bottle’ and who had not a word of French, was left to salvage their life savings form the vineyards. What follows is a remarkable story of struggle and transformation whereby her tiny 4 hectare plot has become a major estate of 21 hectares, where her Clos d’Yvigne wines have won awards and been adopted by wine merchants throughout the world and where she has been hailed as a superstar by UK wine writers. Patricia Atkinson has already been the subject of a Channel 4 documentary and there is further TV interest in bringing her life up to date. She has featured in interviews in The Times, The Observer and the Evening Standard, and on Radio 4’s Gardeners’ Question Time.